Biological balance does not exist in a koipond. Simply because we have a container of water with fish in it which we feed by throwing in pellets. The food is also biological material that we add to the pond so there cannot be a balance. Koi eat the food and converts it into waste. Simply poo, urine and ammonia is excreted via the gills. In a biological system, all this waste is fully recycled by bacteria, plants and eventually plankton and small crustaceans, etc., then the koi can eat these again. In our small ponds, the size of this cycle just is not big enough for all waste processing so waste builds up. Even plant filters, that are fortunately increasingly often are built as additional filter, will not help enough. We have to prohibit the accumulation of waste using filtration and by regular water changes. With a (pre) filter we remove the poop, food residues, leaves, etc. as soon as possible from the water so they do not even have to be broken down in the nitrogen cycle. The waste that is already dissolved will be converted to relatve harmless nitrate in your biological filter. 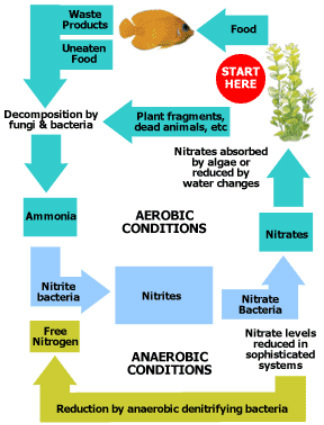 With regular water changes, we ensure that the nitrate levels stay low. (supported by a plant filter that also removes nitrates from the water).